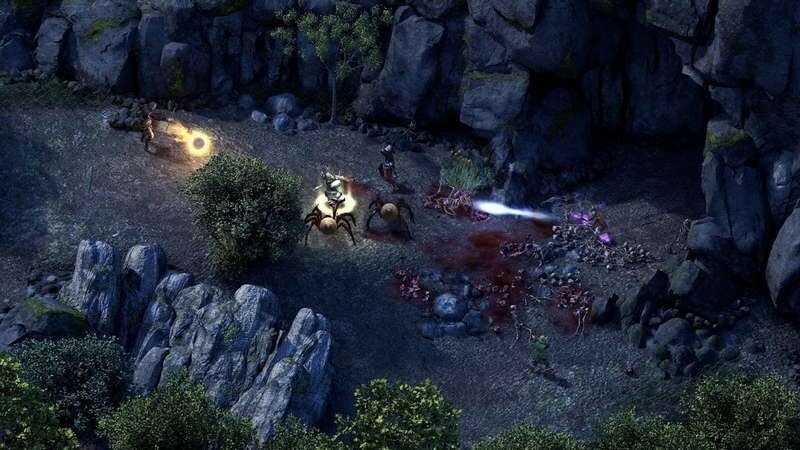 Pillars of Eternity review – RPOMG! 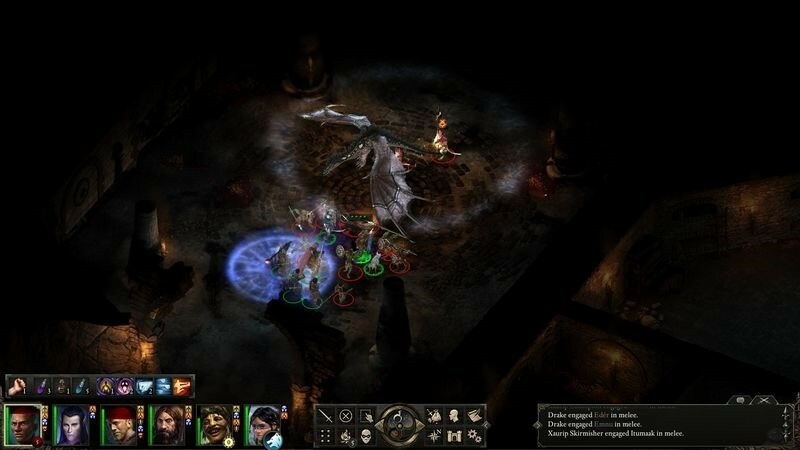 So, here we have Pillars of Eternity: The hugely funded kickstarter game that promised a return to the RPG glory days of the Infinity Engine, bringing on many of the same creative developers from those glory days as well. Kickstarter is an interesting beast, as it both allows for otherwise impossible ideas to sprout while also filling supporters with the dread that these very dreams and hopes could be crushed by a promise broken. Which is exactly why it’s so damned refreshing to see that Pillars of Eternity turned out to be one project that actually fully delivered on what was promised. The story takes place within the Dyrwood, a colonial nation established by a distant empire, attracting many who wish to settle the relatively untamed lands. You find yourself traveling with a caravan transporting many such prospective settlers, but things quickly turn sour as things tend to do. After surviving a monstrous magical storm known as a biawac, you wake to discover you suddenly keep having visions or memories of things you’ve never done, you can see the memories of others, and can even converse with the dead. You soon find that the promised land of milk and honey is quickly falling to despair as an affliction known as the Legacy sows panic, fear, and paranoia among the locals, and so your journey begins to discover what has happened to you, as well as the nature and cause of this Legacy. The game prefers to take a slower approach to story, steadily dipping you into the world and the fiction that supports and surrounds it. As your character is an outsider, you aren’t expected to know anything about the region, and so it’s perfectly natural to discover it for the first time as you play, learning about the Legacy and the culture within the Dyrwood. The game’s writing is fantastic, and the voice acting hits the ball out of the park. The opening scenes set the tone perfectly, and are perfectly reminiscent of an expert game master orating the opening scenes of a new tabletop roleplaying campaign for his players. This is definitely an experience that expects you to read and sit through and read or listen to lot of text for full effect. In fact, there are quite a few nice comparisons to written story telling in general. People you interact with will speak to you, fully voice acted, but the text is interlaced with unvoiced descriptions detailing their body language as they speak. It’s enjoyable, and it adds another layer of narrative depth. Visually, the game is impressive not for technical fidelity, but for its dedication in recreating the visual look and feel of the classic Infinity Engine games. The camera remains locked into a single perspective, only allowing zooming, and the environments adopt the more classic “flat map” illustrative style rather than actual three dimensional environments. 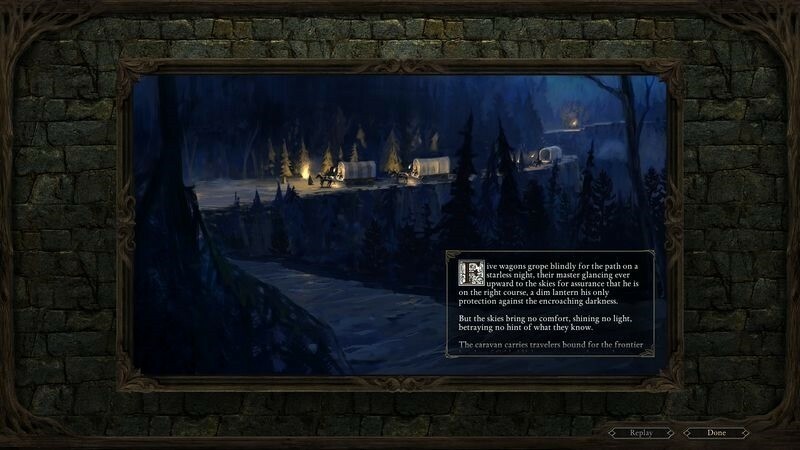 For those who played games such as Baldur’s Gate, Planescape: Torment, or Icewind Dale, you will feel immediately at home. It’s actually a bit surprising how familiar it is when the game first starts off and you are first introduced to how the game looks and feels, but it’s a good surprise, like meeting a cherished childhood friend you’ve not seen in years. The manner in which the game functions is reminiscent of the classics as well, though it’s also one of the places where the game has looked to differentiate itself from its older relatives the most. Combat in Pillars is a mixture of Real time and turn based, in that while it acts out in real time, you can pause the game at any time to issue orders to the adventurers you control. Considering the imposing challenge presented by the default, or even easy difficulty setting, this will be used near constantly. You often need to make split decisions, reacting to how and who the enemy chooses to engage, as while many will be happy to throw themselves into your front line, many will instead prioritise your squishy ranged characters in the back and run around to fight them instead. To make matters worse, attempting to move away from enemies engaged with you allows them to get an automatic hit on the fleeing adventurer, making engagements involving a character you’d rather not be stuck in the middle of the fight far more precarious. Activated combat abilities are broadly split into two types, encounter abilities and rest abilities. The former recharge after each combat, but only have a certain amount of uses within each combat encounter. The latter only recharge after each time your party rests. As the majority of actions are rest abilities, one always needs to consider how and when they are used so as not to use them up too quickly. As for being the target of attacks and abilities, health is managed in an interesting way. There is an additional layer of survivability, called Endurance. In combat, damage dealt to you reduces your Endurance, with only small bits of that damage carrying over to your health. This is tracked by your characters’ portraits slowly filling with a red bar, representing damage to Endurance. Should a character lose all their Endurance they collapse, but should you win that combat encounter they will stand up again soon afterward, albeit with a chunk of their health lost. Should a character lose all their health in combat, they still rise up after the fight is concluded, but they are maimed. While maimed, they suffer extreme penalties, and any further damage they take kills them outright, and permanently so. Importantly, the vast majority of restorative effects only affect Endurance, and even those that do affect Health do so minimally. Additionally, as characters continue to explore they will slowly become fatigued. The more fatigued a character becomes, the larger the penalties they suffer for it. The only way to fully recover health damage and fatigue is to rest. Which is to say, rest is a rather important mechanic. The need to rest prevents you from simply barraging though entire missions without pause, and it’s a constant drain on the group’s momentum, particularly as it’s the only way to heal health damage. To help manage this, you can carry camping supplies to allow the party to rest when needed, but you are limited in how many you can carry at any one time. Alternatively you can rest at an inn, and while this does cost you, it can also provide the group with bonuses to your stats depending on how much you choose to spend. As you play you’ll eventually gain access to a Keep, which you can spend money upgrading to provide a safe and free place to rest, with additional bonuses to your stats depending on which upgrades have been completed. The keep also collects tax from the world and deposits it into your own pocket, though the amount you get depends how much bandits leave you. The keep itself may also attract unwanted attention, and as such one will be investing in defences and hirelings to protect from any incursion. These upgrades take several in-game days to complete, though you can easily manage every aspect of your keep remotely, regardless of where you are in the game. 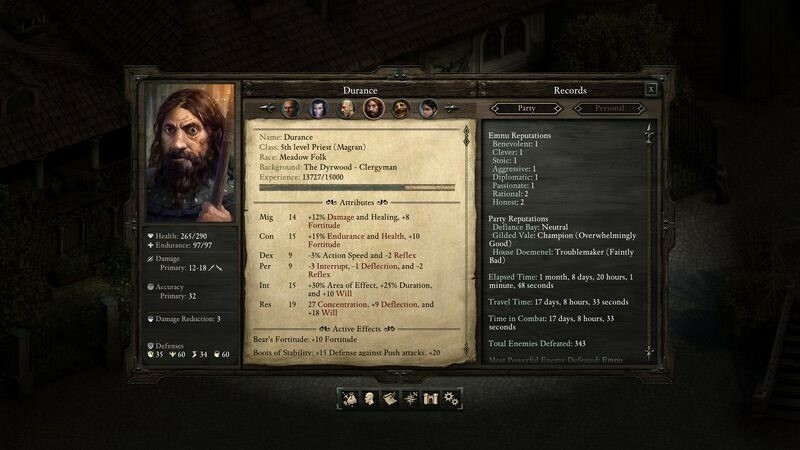 Additionally, as you find more characters to put into your party, those that you don’t use can be assigned to certain quests that may pop up, allowing them to gain experience and grow your renown. The keep also has a darker aspect to it, specifically in the caverns below. A large and long multi-staged dungeon lies waiting, each stage progressively more difficult than the one before, with something sinister awaiting at the very bottom. This is definitely a task you take on piecemeal over the course of the whole game, as the difficulty between floors spikes quickly and often surprisingly. The keep is certainly not the only place with hidden mysteries, as Pillars does a fantastic job of stuffing hidden wonders all over the place, though these can often turn out to be a very nasty mob of creatures hiding in a certain spot on the map which catch you unprepared. 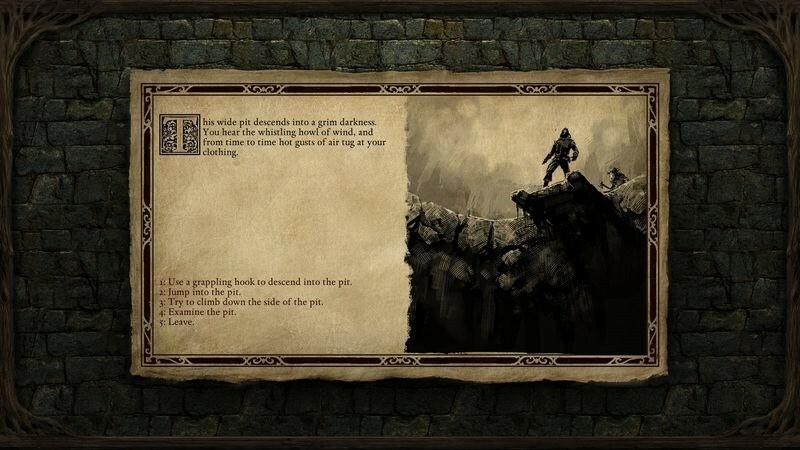 While exploring the world, certain encounters shift to a book styled visual narrative in which you can choose from various choices how to act in response to the information given. The result isn’t binary either, there’s number crunching going on behind the scenes based on your characters’ stats, and the narrative told to you based on your decisions differs depending on how you or your characters fare depending on their characteristics. It’s a great bit of storytelling that also serves to build tension, as choices can often have immediate dire consequences. One other thing the game does very well is character reputation. How your main character is perceived by others is based entirely on conversation options you choose. Choose the caring options and your reputation will paint you as a kind person, and people interact with will keep that in mind. This can both reveal hidden conversation options or even quests with people you may meet, or simply lock them away if you simply aren’t the type of person the quest requires. Additionally, there are no specific social characteristics to worry about as your standard characteristics alone, such as Perception or Might, will unlock otherwise hidden conversation options. These aren’t automatically superior to your normal choices, however, and can cause more trouble if selected without thought, but they do always help build your reputation. That said, it’s never entirely clear exactly how your conversation choices affect your reputation, and it’s a very slow, steady, and subtle process that builds up the larger perception the world has of you, even one you may not realise you’re building. It’s a great way to build the story around your character in a meaningful way, and it’s a delight to see how those choices affect your adventures farther down the line. 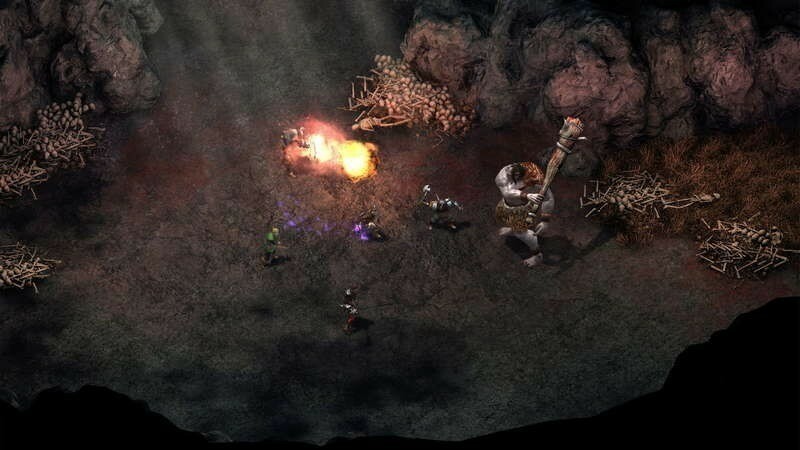 Pillars of Eternity is a wondrous return to form, the latest and greatest from a recent move to revisit RPG classics. It's certainly the best RPG experience I’ve had for many years, and a massive part of that is how it approaches its story telling. If you enjoyed the Infinity engine games, you will have an absolutely fantastic time with Pillars of Eternity. It's a huge reminder of all the things I never knew I sorely missed from the roleplaying genre.